Because I spend so much time in there, I needed something that would ensure my comfort and put me in an appropriate mood to write the crap I spew here. Introducing the Official Nittany Turkey Signature Model commode. (I like all the “sanitized” terms we have for a damn toilet: commode, water closet (W.C.), loo, little girls’ room, john, jane, head, goin’ to see a man about a horse, lavatory, wash room, etc., etc.) To me, though, it’s always a crapper. I must now repair to the crappatorium for some solace. Due to recent trip to the Holy Land, I’m seriously delinquent in publishing my PSU ruminations. I’ve got a pile of stuff backed up (take that any way you want), so I don’t know whether I’ll get caught up today or not. 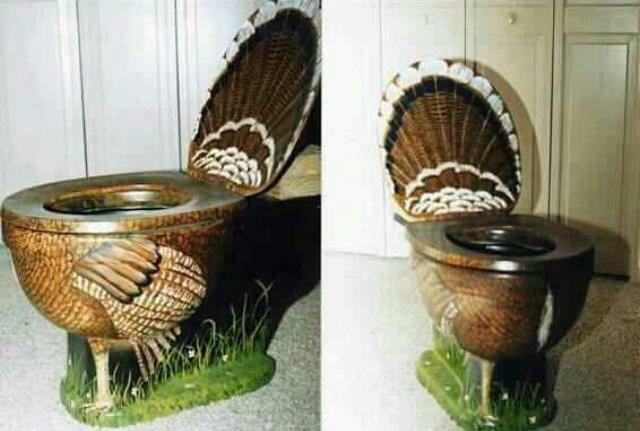 Don’t flush the Turkey just yet! Big thanks to Artificially Sweetened for thinking of her man in this context!